Put the spices, treacle, golden syrup, sugar and orange juice into a saucepan and heat until it boils. Remove from the heat and stir in the margarine. Stir in the flour a little at a time so you get a smooth dough. Leave to cool for about half an hour. Scrape the dough out of the saucepan and knead with plenty flour until it becomes manageable. 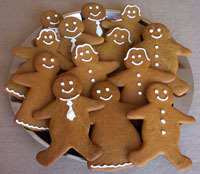 Roll out to about 4mm thick and cut out with gingerbread people shaped cutters (optional). Place on a baking sheet and cook for 10-15 mins. Be careful here as they don't change colour until they are overdone!